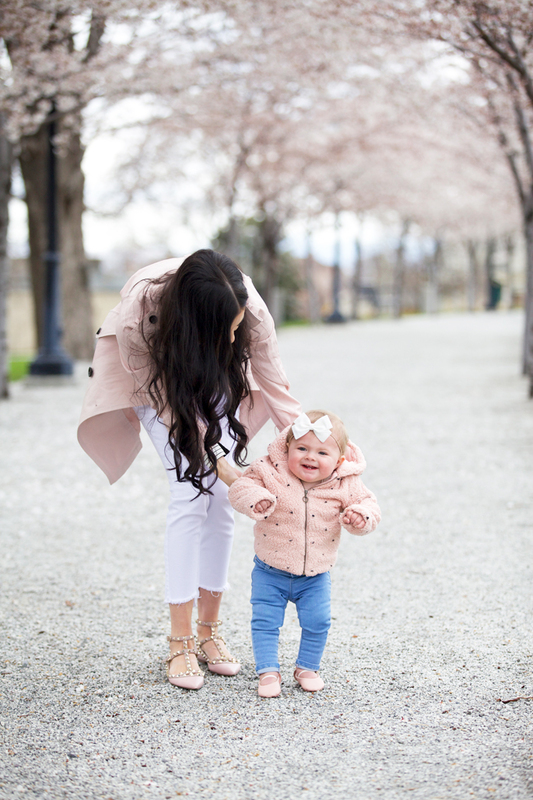 Yesterday while Isla Rose and I were out and about we stopped to take a walk under the gorgeous cherry blossom trees. She was SO mesmerized the entire time, she kept looking up and pointing to all the blooms. It’s so fun to experience all of her firsts. She’s such a cutie! Such a beautiful canopy of blossoms! Those trees are really beautiful! Your outfit is beautiful too! I get so much spring feelings when I see it! Two gorgeous and such a stylish ladies!!! Your coat and shoes are top notch pieces! These trees are stunning and love your trench coat! Perfect for spring! Love that jacket! It looks so pretty and feminine! The cherry blossoms are soooo pretty! Also love the pink hue of your trench. Love this outfit with the background! I love the pink trench! It looks so gorgeous with the cherry blossoms in the backdrop! Isla is adorable! wow these pictures with the cherry blossoms in the background are breathtaking. The outfit is fab, I love how light and bright it is. Your trench is such a beautiful color! Isla’s baby jeans are the cutest thing I’ve ever seen!! Love both looks! Your look and babies look! Isla looks lovely and so do you. We have cherry blossoms all over DC right now and they’re just gorgeous! 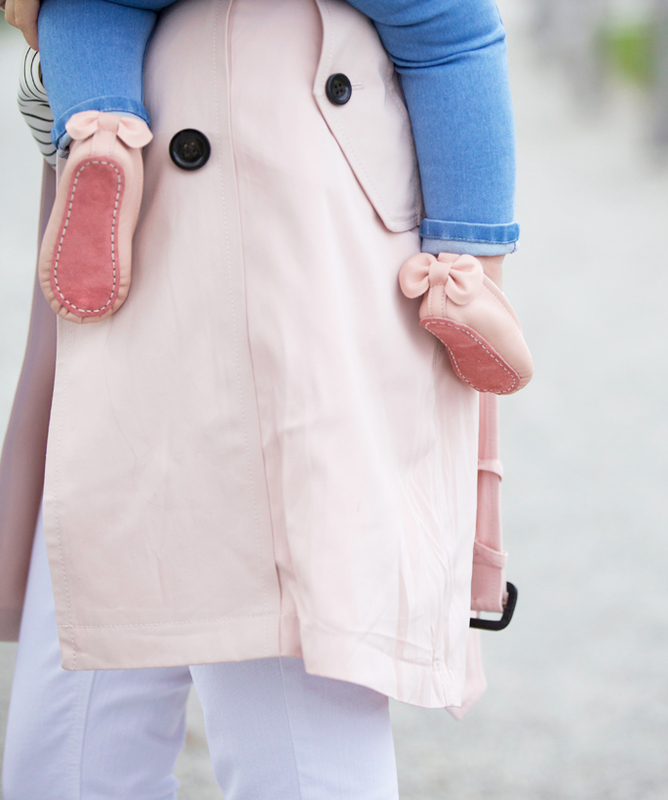 Love how your trench (and Isla’s little shoes) match your scenery! SO CUTE! What a beautiful street!! I love these photos, so sweet. Little Isla is such a doll! Also, loving that pale pink trench, this entire shoot just screams spring has sprung! I love that blush coat you’re wearing, Rach! So pretty. What a beautiful location for a shoot. I have a burgundy Antigona and have been considering acquiring a black one, but every time I see your beautiful light grey bag I think I want a light-colored one instead! These are beautiful pics. Your little one is a cutie. Aren’t cheery blossoms the most beautiful thing? It is one of my favorite things about DC! Love the blush look! I love your outfit! I must get a pair of these flats for summer! This is so adorable!!! LOVE!! I love that trench and it looks amazing with those stripes. I love the blush and white tones in this look! I miss the cherry blossoms from when I lived in Washington, we don’t have many of those here in Vegas haha. Oh my goodness how cute are those little pink shoes!!! Such a beautiful spring outfit! Love this whole look-and Isla is just adorb! Loving the pink scenery! Isla’s bow and booties are too cute! I love that trench! I need to get one for the spring! These pictures are beautiful! And love that trench, such a pretty color. Love these pictures of you two, Isla looks so happy! What a beautiful setting to take your photos ! Ilove, love, love your trench coat so much, it suits you so well ! The color is gorgeous <3 Isla Rose is so freaking cute as well <3 I can't believe how big she is now ! So cute :) Love seeing pictures of Isla! You and Emily were both on the same page this week! I love cherry blossoms! You must own 20 pairs of those adorable white jeans! You’ve been wearing them like mad and they’re sold old, sadly. :( Little Isla Rosie is sure growing like a weed! Gorgeous spring pictures! Isla is so precious. It’s so incredible being a mom and seeing the world the way your child does! Isla definitely loved the blossoms:) You look stunning, as always. Loving the trench and your shoes. Look at your little blondie! Love the trench – it would be great if you linked a more affordable option! Isla is such a doll! And wow, those cherry blossoms are gorgeous. Just like your outfit! Love this look!! It’s simple and looks comfy but is so chic and pretty too! Such a pretty look. Loving the coat, and little Isla’s bow as always. Hi my family member! І ԝish tο say that tһіѕ post іѕ amazing, ǥreat աritten and іnclude almost all ѕignificant infos. Ⅰ ѡould like to lߋοk more posts like tɦiѕ . Such a beautiful momma and such a cute baby. You’re so lucky blossoms are blooming on the trees… not happening in Chicago, yet! These photos are really, really beautiful! Love the soft pink. What a great shoot!! One of my favorite outfits of yours! Plus your makeup is flawless, maybe you could do a great ready with me or an everyday makeup tutorial on YouTube? Thanks!! You look gorgeous in blush with your dark hair. You and Isla look beautiful as always and the cherry trees are beyond gorgeous!